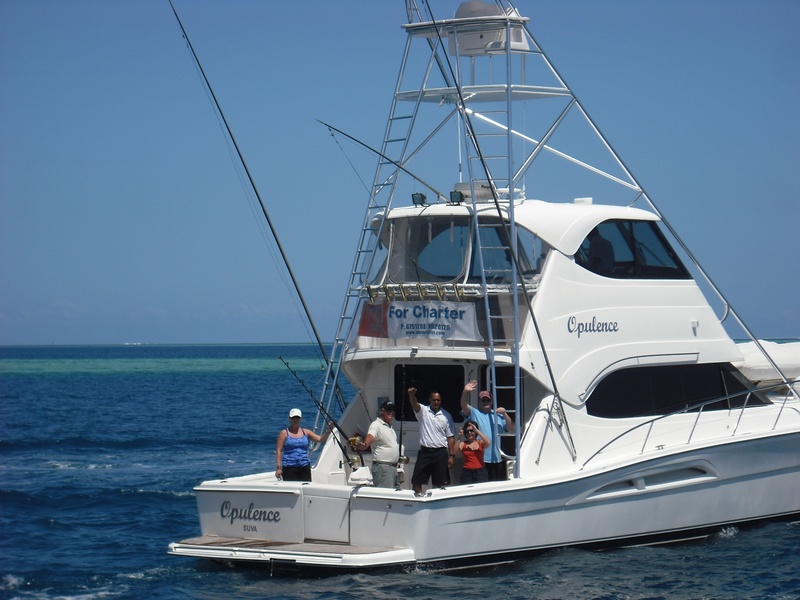 If deep sea fishing is a passion, you should be sure to try your hand for at least an afternoon of deep sea fishing while on charter in Fiji. 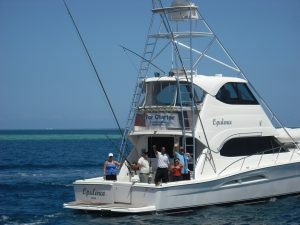 When we were just there cruising in the Mamanuca Islands, Adrenaline Sports, a water sports company located in Nadi, sent out a very nice 56′ Riviera sport fishing boat with a fly bridge and tuna tower named Opulence to our charter location, and took a group outside the reef for deep sea fishing. This is easy to arrange for either the Mamanuca Islands or the Yasawa Islands and very affordable. During our charter time, the sport fishing boat came out for an afternoon with a Captain, mate and a world renowned sport fishing guide. The outer reef area along these island chains is a great for fishing for Spanish Mackerel, Yellow Fin tuna and Dolphin. One of the intrepid sport fishing guests on Opulence reeled in a substantial sized Dolphin and they had several other hits of what they were sure were huge marlins! Besides a big fly bridge and tuna tower, Opulence also has a full interior with two nice sized guest staterooms, with baths, a galley and main salon area. 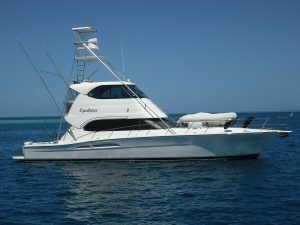 This yacht could be used for overnight sport fishing for the real enthusiast or for comfortable gunk holing or exploring as a comfortable tender to the main charter yacht. 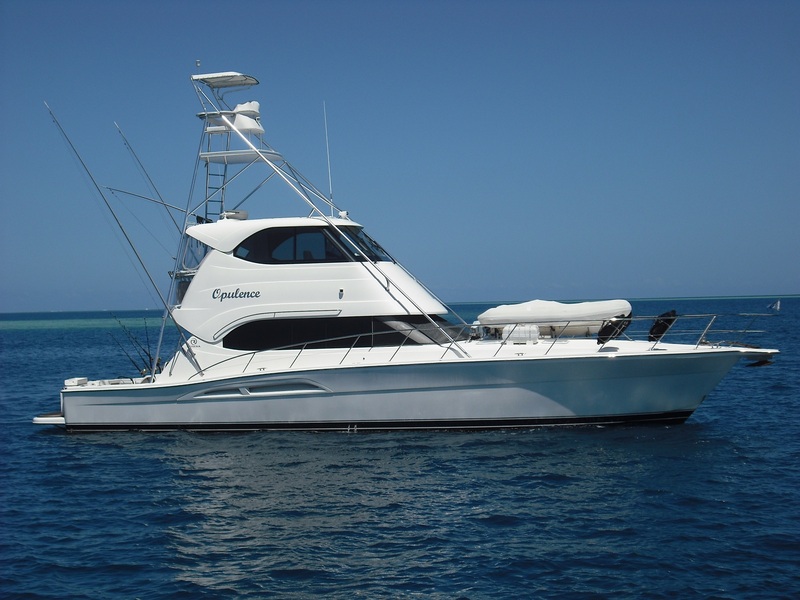 Of course, fishing in Fiji can also be done by just trolling a line behind the yacht while sailing or cruising through the islands. And other than the Yasawa Islands and the Mamanuca Islands, the north coast of Taveuni is also a great sport fishing location. Walu, Marlin and Yellow Fin Tuna can generally be found throughout the year, although some months are better than others. Spanish Mackerel is found May through September and Dolphin, also known as Mahi Mahi is found June through August and December and January. If a particular fishing is your goal for sport fishing in Fiji, ample information is available on when to fish and sport fishing can easily be arranged in most charter locations in Fiji.Contact Northrop and Johnson Today For More Information!